Summary: A look at the ratings agencies. What is their real function in our system? Who do they serve, and how well do they perform? The answers are not what the news media usually tell us. Should we fear the ratings agencies? The first part of this is painfully wrong, another example of progressives mocking the highly effective machinery concentrating wealth and political power in America. They mean well, but their mockery only masks the powers at work. Banking executives get paid billions while their banks grow, implode, and revive with government aid — and we mock them, stupid people whose descendents need not work for a dozen generations. Politicians enjoy celebrity lifestyles, retiring wealthy — they must be idiots and fools. Rush Limbaugh, whose campaign of misinformation and misrepresentation have brought him wealth and fame while helping forge the movement now dominating American politics. In fact these people perform their roles in our system, doing so very well and getting well paid. Closing our eyes to this and laughing shows our foolishness, not theirs. Back to our subject — Standard and Poor’s acts as a profitable and vital cog in the Wall Street machinery, providing cover for rapacious but profitable corporate behavior (only rarely so self-destructive that it causes default). They rated Executive Life Insurance as AAA in January 1990 despite its massive junk bond holdings; it collapsed in April. S&P lowered the rating on Lehman from A+ to A in June 2008; it filed for bankruptcy on September 15. S&P considered subprime mortgages as a AAA foundation for securities fueling massive banking profits — until they collapsed. See this New York Times article for more examples, such as Enron and Worldcom. Studies done by all three agencies themselves since 1999 show that public bonds default far less often than corporate bonds with similar, higher credit ratings. In fact, public bonds with low ratings have lower default rates than the highest rated corporate bonds. They have maintained the dual standard to financially benefit bond insurers, investors and ultimately themselves. This rating charade created a Wall Street shell game constructed by the ratings agencies for the benefit of the bond insurers — which enabled the bond insurers to profit from unnecessary premiums and interest paid by taxpayers. It gets better. Deficit-creating policies are evaluated differently depending on their utility to America’s stakeholders (I’m not one, and you probably are not one either). Not a peep from S&P about Bush Jr.’s tax cuts in 2001 (benefiting mostly the rich) that changed the trajectory of US finances – from the surpluses (inherited from Clinton) eventually paying off the national debt — to and endless stream of deficits. But S&P springs into action when the time comes for cutting spending on medicare and social security. Their analysis appears to be without an analytical foundation (see Krugman’s “The Arithmetic of Near-term Deficits and Debt“). Their conclusions were off by $2 trillion. But theirs is a political imperative, not an economic one — so they launched the downgrade anyway. (2) Should we fear the ratings agencies? One thing you sometimes hear is that the game will be up when the ratings agencies downgrade U.S. debt. I wonder how many of the people saying this know that Moody’s and S&P downgraded Japanese debt in 2002, with Moody’s actually putting it below Botswana and Estonia. 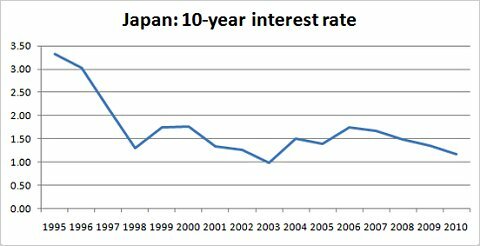 And 8 years later, Japan can still borrow at less than 1%. Do you see the downgrade? Downgrades of other developed nations, such as Canada (down from AA in October 1992), have had similarly trivial effects. On the other hand – Japan had (and has) lacks the internal political strife of the US. Republicans are in the endgame of their decades long program to rollback much of the New Deal, and appear willing to risk several damage to the US economy. Plus there is a widespread if diffuse nihilism in US society, yearning for a cathartic collapse and rebuilding. Look at writings of the Tea Party. And in the articles and especially comments of fringe investment websites like Zero Hedge. Reliable forecasting, even over short time horizons, may not be possible today.